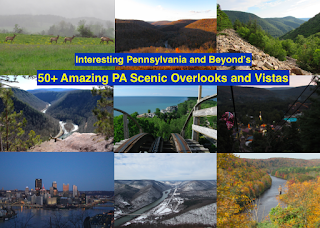 Pennsylvania has many great scenic overlooks, thanks to its many mountains and worn away plateaus. By no means is this an all encompassing list, since with the state's glaciated plateau and mountainous, and hilly topography, there is a seemingly unlimited amount of opportunities for scenic views. Here are some of our favorites. We highly recommend checking them all out, for they truly are some of the best that the state has to offer. Hyner View State Park has a jaw dropping view of the valley of the West Branch of the Susquehanna River from 1300 feet above it. This sweeping vista was so good that it served as the lookout point for a forest fire watchtower. For more background and location information, check out our article. It is a tough call between our favorite three overlooks on this list. The slight edge goes to Hyner, but High Knob gives a view that is so commanding and goes on for dozens of miles. In fall, the colors look almost as if they are on fire. The view looks as if it came straight out of a Bob Ross painting. Purely spectacular. One glimpse and it is easy to see why Worlds End State Park is such a huge natural attraction. From the many hikes, to the geological formations, and from the beautiful Loyalsock Creek and its covered bridges, this is an awesome destination for outdoor recreation. Loyalsock Canyon Vista is a place that I could spend hours at. Bring me a picnic lunch, pack my camera, tripod, a blanket, and a chair, and I would feel like I am on top of the world. This vista is phenomenal. Since the start of the automotive age, the PA Grand Canyon has been a natural draw for visitors. The views are nothing short of spectacular. The Pine Creek Gorge affords many great views, the best of which can be found and Colton Point and Leonard Harrison State Parks, Barbour Rock, Bradley Wales Park, Lebo Vista, and others. There are many opportunities for sightseeing, hiking, distance bicycle riding on the Pine Creek Rail Trail, and more. For more information, check out this link. Knoebels has a way of collecting awesome rides that need a new home. One of these rides is a former ski lift that carries you to the top of a mountain that overlooks the entire amusement park. This 14 minute ride gives you stunning views of the natural surroundings of Knoebels, one of my favorite places in the entire state, and our overall favorite amusement park. The Ridenour and Hawn Overlooks give stunning views over the Juniata Valley and Raystown Lake. The view from Hawn's at sunset is about as spectacular as it gets. Seeing the reflections of the light upon the lake, along with the boats cruising the lake, is absolutely beautiful to see, in addition to seeing the moon rise. This is an awesome place to take in a sunset. Winslow Hill, and the overall Elk grazing area, are home to sweeping natural vistas. These are also a story of triumph over environmental degradation. Winslow Hill was once strip mined and a mess. The land was rehabilitated, creating grazing lands for elk that were reintroduced to the region many decades earlier. Now, you may often see hundreds of elk at a time at this spectacular place. The Standing Stone Trail is home to seemingly endless scenic vistas along its 80 mile length. Two of the vistas have made it onto our list, the Throne Room/Hall of the Mountain King and the Thousand Steps in Jack's Narrows. These are some commanding vistas and they require vigorous hiking, on one of the premier challenging hiking trails in the state, the Standing Stone Trail. They had a tremendous vision when they created this trail. The trail travels across mountain ridges, providing spectacular views any way that you look. The tops of the mountains in this specific region are filled with large rock scrambles, making for some exciting hiking terrain. Our second overlook along the Standing Stone Trail provides a fantastic overlook of the Juniata River and Jack's Narrows, a place that the river created that carries the former Main Line of the Pennsylvania Railroad and the historic Route 22/William Penn Highway. There are roughly 1100 steps and they were once the daily commute for quarry workers. Now the steps serve as a fantastic hike and lead to a sweeping set of overlooks. The Marie Antoinette/French Azilum Overlook gives a view over a spectacular bend in the Susquehanna River from just off of Route 6 in Bradford County. On the other side of the river is a settlement that was built for French asylum seekers during the French Revolution, when masses of French common people, both French nationals and the people in colonized lands, such as the Haitians, stood up against the French elites. Because the royal family and elites had allied with the Americans in the revolution, a number of prominent people created this village for French asylum seekers to settle in. A number of these people still remain within the region. Marie Antoinette is rumored to have been headed here, but the French people decided to not heed her classic advice to "go and eat cake." While that quote may or may not have been said by her, we do know the fate that she faced in place of possibly ending up in PA's beautiful Susquehanna River Valley. Filled with history, this geological formation over looks a horseshoe bend in the Susquehanna River. Its wide open placement made it a signal place for the local Native American tribes. This overlook is roadside on the historic Route 6 corridor, just like its nearby neighbor, the Marie Antoinette Overlook, which provides a view over another similar meander in the Susquehanna River. Simply a stunning overlook. Little Round Top is possibly the most historic lookout on this list. It overlooks the "Valley of Death," a place in which tens of thousands of people died to create a stronger and more inclusive nation. The geology of the Gettysburg area, with these small hills and rocky formations, played an integral role in the US Army being able to flush out the Confederates and reunify the country. The sacrifices made in this area make this a solemn and important place to reflect. Kinzua Bridge is absolutely beautiful. This former rail trestle was the largest in the world when it was first constructed over a century ago. An F3 tornado ripped down a portion of the bridge. Since the storm, the remaining portion of the bridge has been reinforced, and a glass floor skywalk was added to the end, so you can look down nearly 200 feet into the harsh gorge the bridge crossed. This bridge is a monument to engineering and it is incredible to see. Hickory Run State Park is one of the prettiest state parks in the state. Between the excellent hiking, camping, waterfalls, the boulder field, and the Lehigh Gap, this state park in the Poconos is excellent. The Fireline Trail offers my favorite vistas in the park, showing tremendous views of the Lehigh Gap. The views look as if they were the inspiration for impressionist paintings. Truly magical, especially in the autumn with vibrant colors. You can also bike and paddle through the entire Lehigh Gap. We recommend exploring all the way down to Jim Thorpe, which is accurately labeled as the "Switzerland of America." You can catch the Lehigh Gorge Scenic Railway to soak in the views as well. 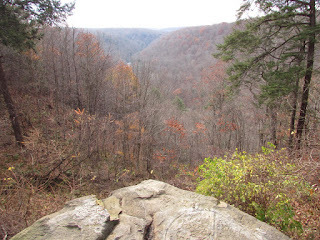 The Glen Onoko Falls area and Tank Hollow, in addition to a myriad of other places, offer tremendous views of the gorge. And some West End Overlook sunrise action! Fireworks night at Pittsburgh's West End Overlook. Brady's Bend Overlook provides a stunning view of a horseshoe bend in the Allegheny River. The views are fantastic and the drive around the area is beautiful. This has long been an attraction for travelers to see, and we make a point of getting up to this vista as the seasons change. Additionally, there are some spectacular railroad remnants located nearby on the banks of the river. Kentuck Knob Overlook. The Kentuck Knob Overlook at Ohiopyle State Park is located near the park's campground, and close to Frank Lloyd Wright's second most famous work in the area, the home at Kentuck Knob. The Baughman Overlook is perhaps the most famous of the overlooks at the park. The geology of the Yough Valley lends itself to really great views, many of which can also be seen on a hike up the Laurel Highlands Hiking Trail. The Kennerdell Overlook provides a spectacular view over another bend in the Allegheny River, just north of Brady's Bend. It too is home to some nearby neat railroad remnants, in addition to a pretty waterfall. Potter County has dozens of overlooks. Seemingly everywhere you go in Potter County, you run into overlooks. They don't call it "God's Country" for nothing! Potter is one of the most rugged and remote counties within the state. The Route 40 Overlook in Hopwood, deep in the Laurel Highlands and near Ohiopyle State Park, Fallingwater, and Laurel Caverns. This overlook looks over Uniontown. The colors are especially vivid at this spot, in addition to Ohiopyle State Park. This overlook is located right on the border between Centre and Huntingdon Counties. It gives a tremendous view over the mountains and the beautiful farmland in the valley. It is located along the Mid-State Trail and McAlvey's Fort Road on the border of Centre and Huntingdon Counties. Both of these hikes are located within a half mile of each other, tops, across Laurel Ridge, just off of the historic Lincoln Highway/Route 30 Corridor, on the border of Westmoreland and Somerset Counties. The give a tremendous view of the Laurel Highlands, right near Linn Run State Park and Laurel Mountain Ski Area. I rate these hikes as easy to moderate. The biggest challenges are the ankle busting small rocks and respecting the size of these outcroppings, through not putting yourself into a precarious position when you get to them. The views are tremendous and these are some of the best hikes in Western PA.
Buchanan State Forest offers a tremendous drive across the Sideling Hill Mountain Ridge just off of the Lincoln Highway/Route 30 Corridor in Fulton County. The views afforded here are simply incredible. This scenic overlook in McConnells Mill State Park, overlooking Slippery Rock Gorge, is often overlooked. It gives an awesome view and is relatively easy to access. The Allegheny National Forest and Allegheny Reservoir afford incredible views. The Jakes Rock and Rimrock Overlooks are particularly fantastic. Mt. Davis, in Somerset County, is the highest point in Pennsylvania, and the views from the top are awesome. Blue Knob is the second tallest mountain in Pennsylvania, and the views from the ski area section are incredible. This is a great place to spend a lazy Sunday afternoon with a picnic lunch. Altoona's Horseshoe Curve is one of the most famous engineering accomplishments of all time. In the dawn of railroading, the Pennsylvania Railroad figured out a way to traverse to rugged Alleghenies without using inclined planes, or a prohibitive amount of tunnels. This path had been utilized as a Native American trail to traverse the Alleghenies as easily as possible. The Tidioute Overlook, similar to the Brady's Bend and Kennerdell Overlooks, gives a tremendous view over the Allegheny River. Two views can be seen from this spot, with one overlooking an environmentally protected island in the river, and the other showing the small borough of Tidioute. 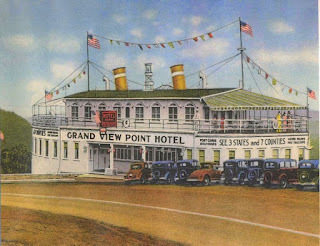 In Lincoln Highway lore, the Grand View Point/Ship Hotel, 18 miles west of Bedford, is one of the most talked about old landmarks. In the days of early highways, service areas and rest stops had to be strategically placed at the top of large summits in order to cool down radiators, fuel up, get a bite to eat, and maybe even spend the night. The hotel boasted a view of "three states and seven counties." 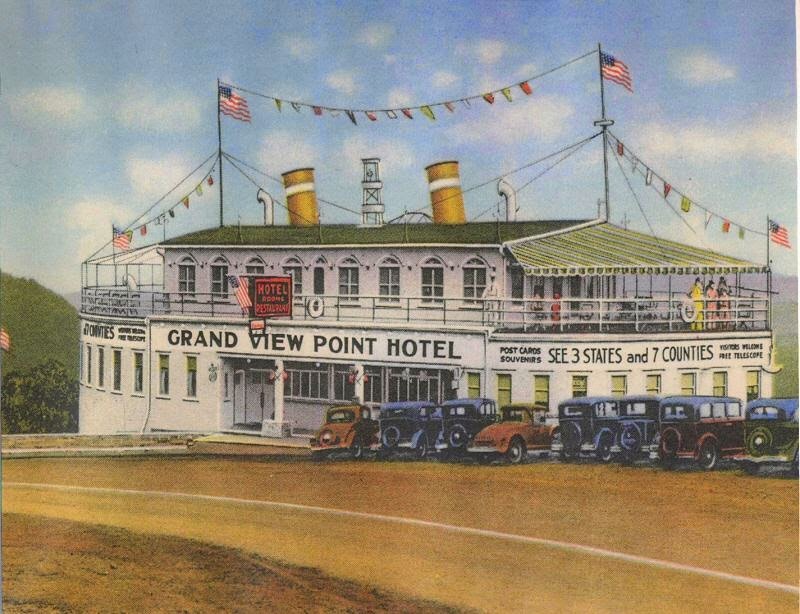 While the hotel is long-gone, the view remains. Johnstown's Inclined Plane is the steepest vehicular incline in the world. Built in response to a need for quicker evacuation the case of another major flood in the city, this incline provides stunning views of the Conemaugh Valley and Johnstown. Cook Forest State Park is home to some amazing views. The Seneca Point Overlook gives a stunning view of the Clarion Valley, including views from an old fire tower, and the nearby Forest Cathedral offers stunning old growth forest. Here is a view of the Forest Cathedral. From South Mountain you can get an excellent view of Bethlehem and the Lehigh Valley. The location is right on Mountain Drive, heading up to Lehigh University's Mountain Top Campus, from the main area of campus. Excellent views can also be seen of from both sides of the mountain up at Lehigh's Mountain Top Campus. Shikellamy State Park hosts some fantastic views of the Susquehanna River, at the confluence of the West and North Branches of the Susquehanna River. Scenic views abound along PA's entire Lake Erie Coastline. From Erie Bluffs State Park to Presque Isle State Park, up through Lake Erie Wine Country, you will be certain to find many awesome views. Follow the Route 5 Seaway Trail along the coastline, and branch off whenever you get the chance. There are MANY awesome vistas to take in throughout the entire route. We love visiting Erie so much that we make a point of getting up there multiple times a year. View of the Presque Isle Harbor Lighthouse, from the Erie Land Lighthouse. A view of Presque Isle State Park and Lake Erie from the Ferris Wheel at Waldameer Amusement Park. Visiting this park and taking in the views is so much fun. Riding Ravine Flyer II, one of the best wooden roller coasters in the world, is an added plus. 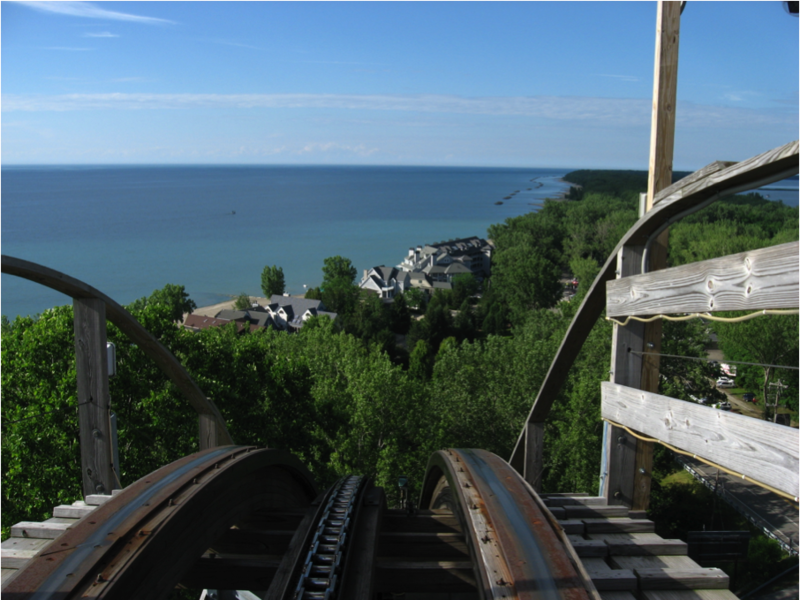 Waldameer is located right at the entrance to Presque Isle State Park. A view of Presque Isle State Park and Lake Erie from Waldameer's Ravine Flyer II roller coaster. A view from Chautauqua Park of Presque Isle Bay, Lake Erie, and Presque Isle State Park. One of the finest highway rest stops I have ever stopped at in my travels across the country is the Route 15/Interstate 99 Southbound Welcome Center in Tioga. 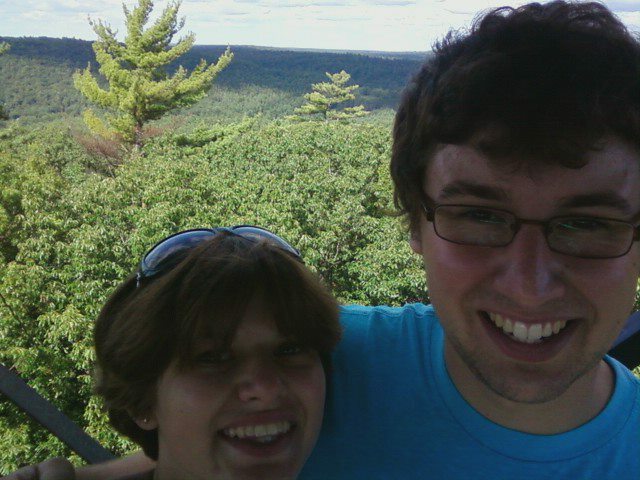 It gives a view of the Upper Tioga River and the Tioga-Hammond Lakes. By no means is this an all encompassing list, but these are some of our absolute favorites. Be sure to check them all out.